(C) 2007 William Schmidt, Ph. D. - All Rights Reserved. without explicit written consent by its author is permitted. Our Hotline Can Guide You through the Turbulence and Introduce You to Peerless Stock Market Timing. TigerSoft provided you data for Perpetual Commodity Contracts. Introductory TigerSoft discussion and Special Price. is coming out for Peerless. 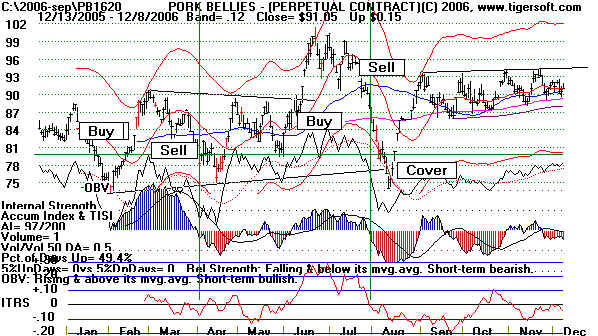 See also 2/26/2008 Food Commodities Streak Upwards. TigerSoft Easily Spotted The Start of Their Moves..
to food commodities in this Global Economy, Tiger is now doing a fine job in predicting their movement. the leverage a trader gets here. page will try to remedy that. This page will grow in the course of the week as time permits. So come back often. with the others. We'll see what revisions and supplemental rules are needed, too. but at least 16 days away and for volume, they use all months' contracts' volume. We go back about two years. 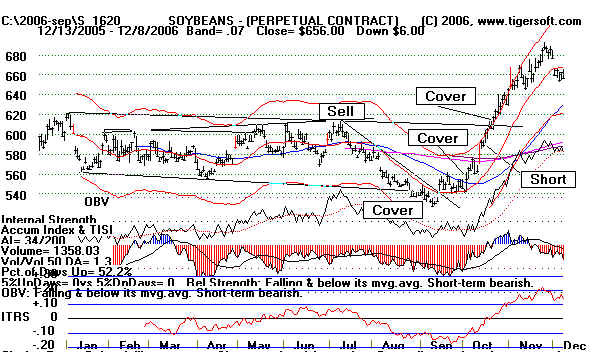 We look at 7 commodities: corn, coffee, cocoa, live cattle, orange juice, pork bellies, soybeans, sugar and wheat. 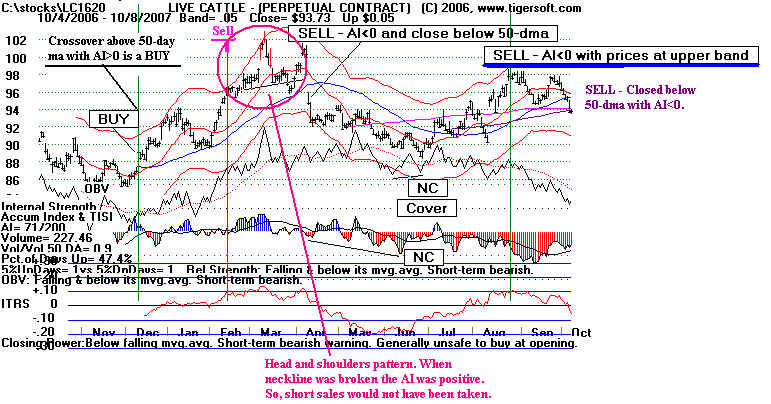 We will be most interested how well price patterns, the Tiger Accumulation Index, OBV and automatic signals work.. 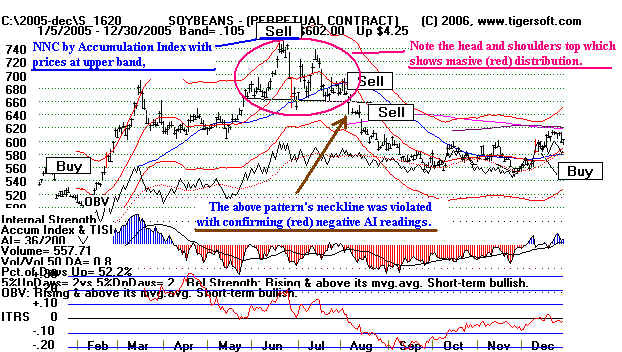 The chart below for corn in 2005 illustrates some basic rules for calling a top with the TigerSoft tools. (1) The July peak was not confirmed by a higher Tiger Accumulation Index. (2) The July peak was not confirmed by a higher OBV (aggressive buying). (3) The breakout quickly failed to stay above the breakpoint at 235. This is a "false breakout". (4) An upsloping head and shoulders pattern is traced out. The breaking of the neckline at 227 is bearish. (6) A simple 20-day Stochastic using the K-Line gave the best signals in this period. That was the optimized best system. evidence of an upturn would be desirable. 8) Buy on first pullback to rising 50-day ma if Tiger Accumulation Index is positive. January 2006. 9) Expect resistance at point where prices previously broke down. 230. 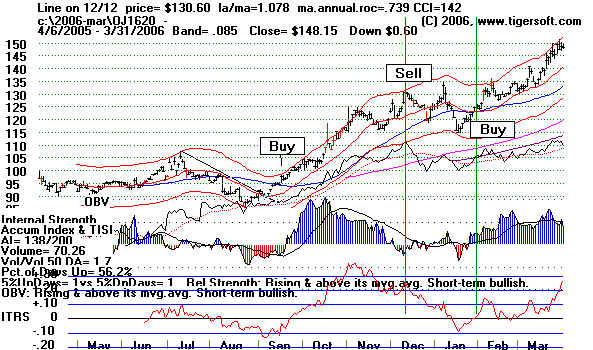 10) Use Automatic Red Buys to trade price uptrend. not confirm. Note non-confirmations on last day of chart. (12) The May peak was not confirmed by OBV and the Tiger Accumulation Index was negative. That is a reliable Sell signal. in July 2005 and stoipped two 3006 rallies. (15) Buy on price breakout above well tested resistance ay 260. September 2006.
not to work. 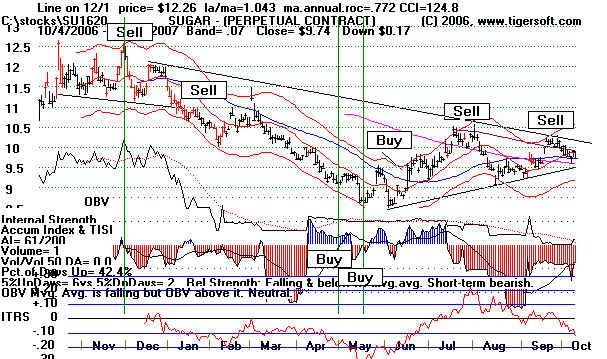 Use a trend-following system or a longer-term Stochastic. (17) Red high volume confirms the breakout and makes it more reliable. (18) The rising of the Tiger Accumulation Index above the first dotted line confirms the breakout, too. 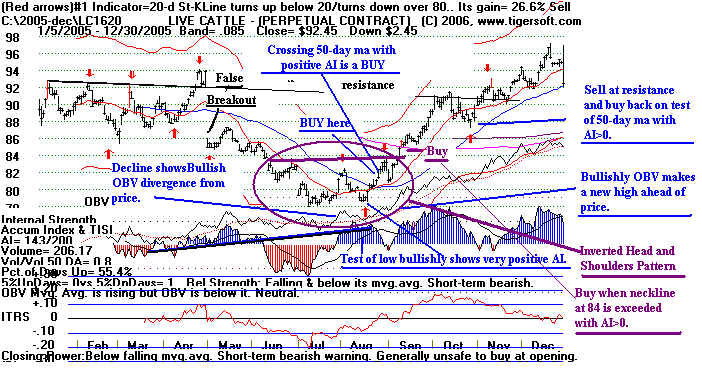 (19) When breakout advance takes place without a pullback, you can add to positions at price uptrend-line. Index. This would be a good place to take profits. (21) Buy at rising blue 50-day ma when current Accumulaton Index is very positive. 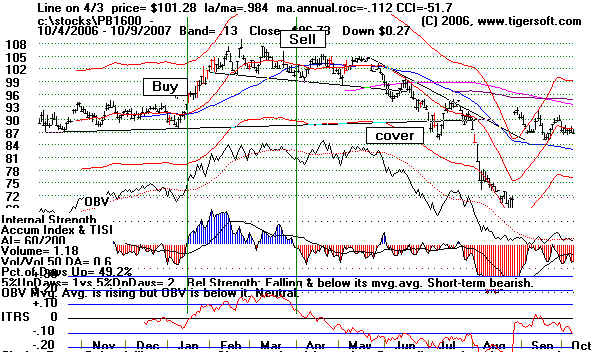 (22) Prepare to Sell at upper band if Tiger Accumulation is negative. Jan., June and Sept. 2007. 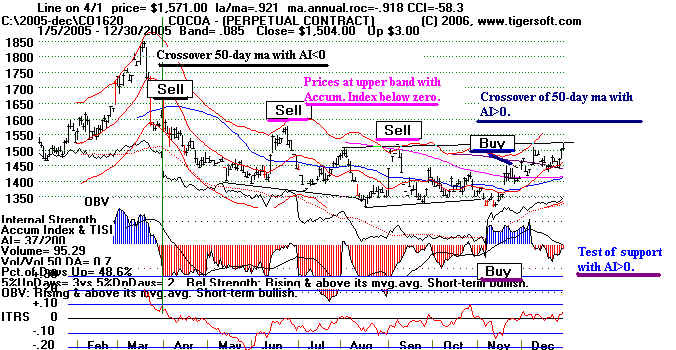 (23) Drop below 50-dma with Accum. 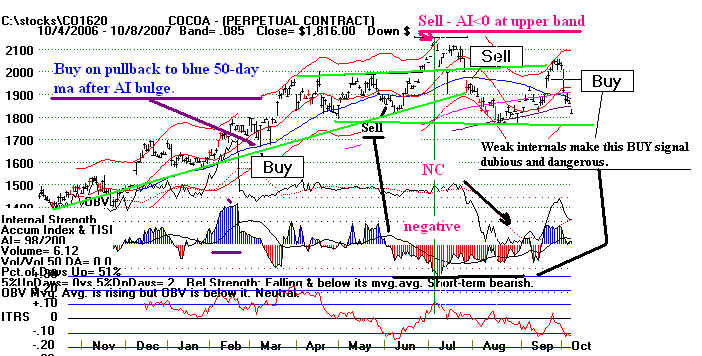 Index negative is usually a reliable Sell. (24) When OBV in declining for more than 2-3 months, prices usually subside. 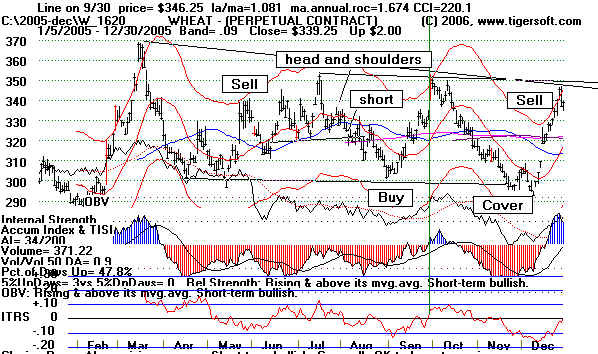 short term trading because Corn has stopped trending. 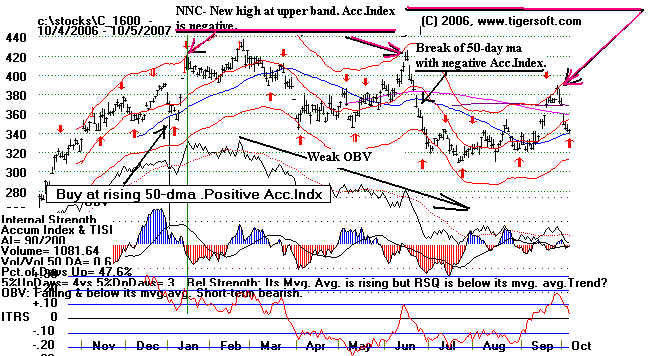 when the OBV faile to confirm the high or low, as is true in the chart below. above the 110 resistance and rise quickly, Perhaps, this is just short-covering. See the short-covering breakout above 119 below. Then a quick top formation appears. 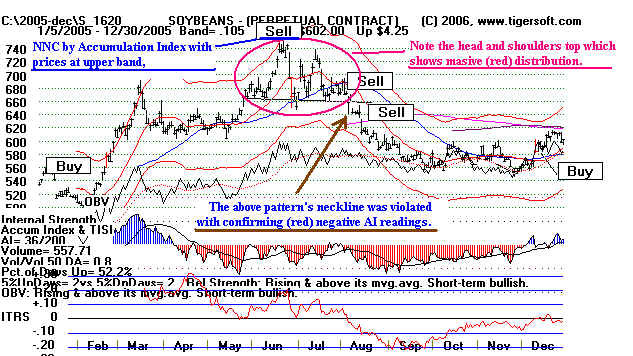 Corn then breaks below its 50 dsy ma eith the Accumulation Index negative, for a Sell. prices would challenging the yearly highs near 129. That is what happened. 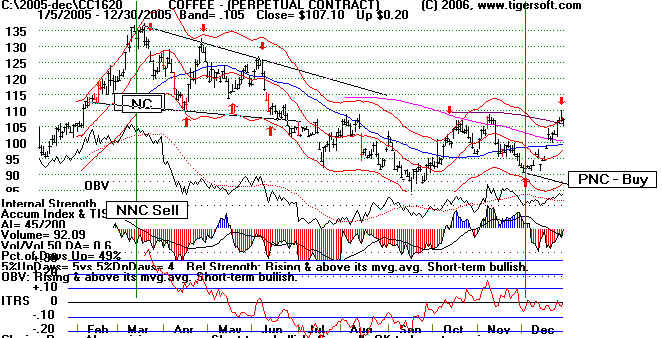 Coffee's rising internal strength indicators predicted September price breakout above 130.
past 130, the Tiger Accumulation Index soared to levels signifying informed, big money buying. Note the bullish breakaway gaps, too. This presently looks quite strong. 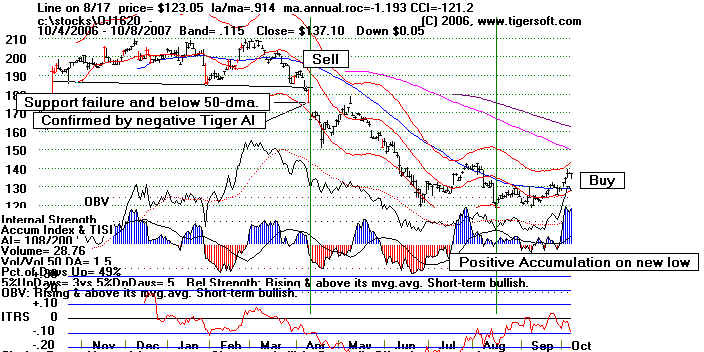 if the Tiger Accumulation Index does not improve markedly. it too is bearishly negative. Index to be good Buys. You can see that in early March. But the rally soon ran out of steam. Index negative. The pattern now developing looks like an extended head and shoulders pattern. Study the chart below. It illustrates a lot. 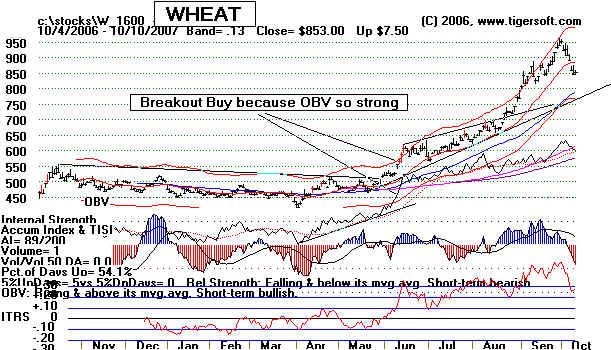 It begins with a false breakout above 92.
above the rising 50-day ma is a BUY with the Accumulation Index positive. works fine until there is a breakout. Trust the breakouts when they are confirmed. reversal pattern in February and March. retaken the long position at 125 two months later.. Stick with the trend when it is supported by a mostly very blue Tiger Accumulation Index. back the long position at 193 in October. 50-day ma should also be considered. It was falling very fast. That means more resistance. here would have been the correct response to these readings. when the Tiger Accumulation Index confirms it. This swings wildly and a simple system is best. Using the same crossover rules and cover at support, these are the trades. The bearish June-July top pattern should stand out to any serious TigerSoft trader. of entry for a purchase, though short sales might be covered then. breakout in October at 620.
post breakout pullback towards its 50-day ma. This is the first reliably entry point. taking profits at the upper band would have been tempting. even though the upper band is reached with the Accumulation Index negative. a Buy on the first retreat to the rising 50-day ma following the breakout. The flat topped . 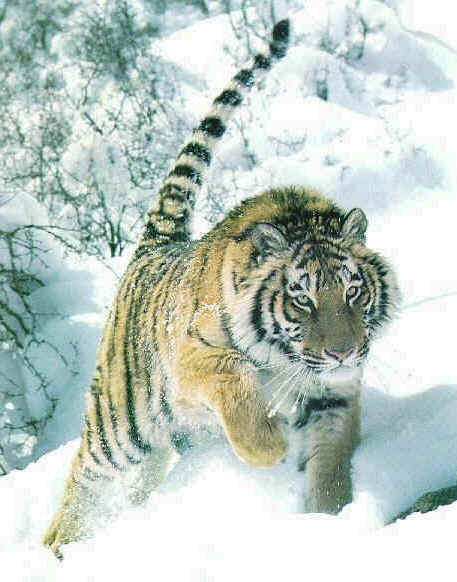 The bulge in the Tiger Accumulation produces a 100% advance in sugar in 6 months. period of time. I suggest this is true after a big advance. Professionals are retaking control. above the 50-day ma, It is a Sell at the upper band when the Accumulation Index is negative. 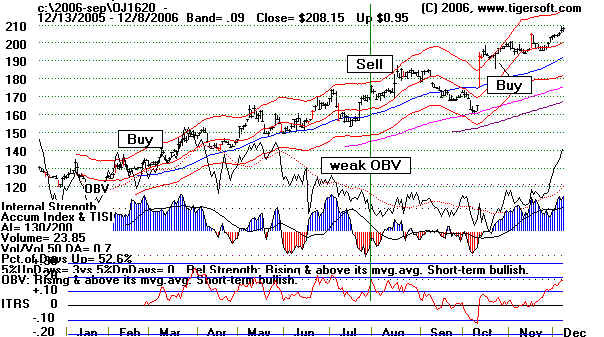 markets are weak a whole, it is usually best to cover short sales on tests of lows. going long on moves past the blue 50-day ma. red 21-day ma is violated. separateshould be respected. Note the bottoms kept rising. 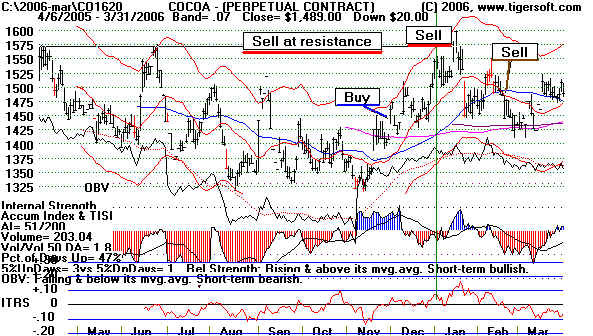 Sometimes prices rise without prior or accompanying high Accumulation. In that case, we would normally expect to see hte OBV Line rising steeply. This means there are no dips to buy patiently. Aggressive buying is predominates. OBV can be taken as a Buy, but added care must be taken.